The Breakdown: What Will Happen if Obama’s Nuclear Arms Treaty Does Not Pass? In April, President Obama and Russian President Dmitry Medvedev signed the New START Treaty, the biggest nuclear arms pact in a generation. But the treaty faces significant Republican opposition as it enters the Senate for a final vote. How would a blocked treaty affect our arms policy and our relationship with Russia? In April, President Obama and Russian President Dmitry Medvedev signed the New START Treaty, the biggest nuclear arms pact in a generation. The treaty, the first of its kind in almost ten years, would diminish both countries’ nuclear arsenals and allow for greater transparency in nuclear policy. Although the treaty has been met with strong objections from some members of the Republican Party, the Senate's Foreign Relations Committee has recently approved the treaty. New START now faces the Senate floor for a full vote. But what exactly is the New START Treaty, and what would happen if it did not pass? 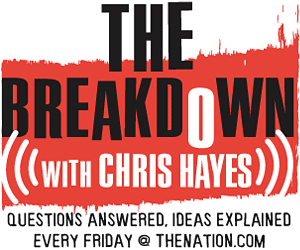 On this week's edition of The Breakdown, DC Editor Chris Hayes and non-proliferation expert Joe Cirincione try to answer these questions and the long term implications for the New START Treaty. In April, President Obama and Russian President Dmitry Medvedev signed the New START Treaty, the biggest nuclear arms pact in a generation. The treaty, the first of its kind in almost ten years, would diminish both countries’ nuclear arsenals and allow for greater transparency in nuclear policy. Although the treaty has been met with strong objections from some members of the Republican Party, the Senate’s Foreign Relations Committee has recently approved the treaty. New START now faces the Senate floor for a full vote. But what exactly is the New START Treaty, and what would happen if it did not pass? On this week’s edition of The Breakdown, DC Editor Chris Hayes and non-proliferation expert Joe Cirincione try to answer these questions and the long term implications for the New START Treaty. More information on our guest, Joe Cirincione. Foreign Policy’s reporting on the Senate committee’s approval of the New START Treaty.